Robinson built these locomotives in 1912-13 for hauling express passenger services. They were not a great success and were quickly moved to secondary express services. Classified as B2 by the LNER, they were reclassified as B19 in 1945 to make room for the Thompson B2 class. Unlike Robinson's previous 4-6-0s, the B2s had inside cylinders. These cylinders were very large for the time, at 21.5in diameter, and the boilers also had a large diameter of 5ft 6in. 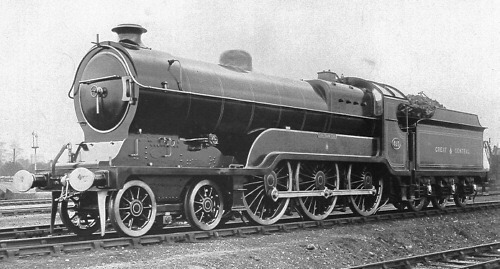 At the time of construction, the B2 boiler were only second in size to the GWR's 'The Great Bear'. The B2s were also the first of Robinson's 4-6-0s to be fitted with superheaters. Despite these new developments, the valve gear was still of the Stephenson type. The first locomotive, No. 423, was named "Sir Sam Fay" after the Great Central Railway's General Manager, and the class would often be referred to as 'Sir Sam Fays'. Although these locomotives were of a very handsome appearance, their performance did not live up to expectations. The piston valves were too close together which resulted in poorly shaped steam passages. Also the firebox was shallow and suffered the same problems as the Class 8C 4-6-0 (LNER B1) locomotives. The boilers were also poorly designed. By Grouping in 1923, two redesigned boilers had been tried on members of the class. One version had less tubes and smaller diameter superheater flues, to prevent the flues clogging. This proved too drastic and the final boiler design showed an increase in the number of flues. Despite all these boiler changes, the small fire grate area was kept. The final boiler design (as described in the technical details below) also became the standard boiler design for the B3, B7, and B8 4-6-0s. This final boiler design was still insufficient for the very large cylinders in use, so the cylinders were lined to 20in diameter from 1921. Nos. 427, 424, and 423 were lined between 1921 and 1922. No. 5426 was lined in 1938, by which time No. 5423 (ex. No. 423) had received new 21.5in cylinders. Orders were placed to line all of the remaining engines in 1943, but this does not appear to have happened. Locomotives with the unlined 21.5in cylinders were classified as B2/1, whilst locomotives with lined 20in cylinders were classified as B2/2. The large cylinder size also gave problems due to the unusually large distance between the centre lines of the cylinders. This resulted in inadequately large axleboxes on the driving axles, due to insufficient space between the crank web and and wheel bosses. Hence, the small axleboxes tended to overheat. Robinson appears to have been aware of all of these shortcomings, because he quickly designed the D10 'Directors' 4-4-0 with smaller cylinders and a smaller diameter boiler, but with a larger grate area and better designed ashpan. The D10 were an immediate success and quickly replaced the B2s on the principle express services. The B2s were built with Wakefield mechanical lubricators, but these were replaced by Robinson Intensifore sight-feed lubricators during World War 1. These were then replaced with a more conventional sight-feed type from 1923 (Grouping) to 1932. Also at this time, Ross pop safety valves replaced the original four-column Ramsbottom valves which were original fitted. Just before Grouping in 1923, labour troubles in the coal industry led to five of the B2s (all except No. 425) to be fitted with oil-burning equipment in May and June 1921. All were converted back to coal burning within 6 months, but the oil-burning equipment was refitted in August 1926 to be removed again in March 1927. Before the arrival of the D10s, the B2s were based at Gorton and operated many of the best express trains. However, the D10s, were much more effective and quickly displaced them to secondary express services on routes to Manchester, Cleethorpes, or Lincoln. They rarely appeared on the London Extension, and very rarely reached Marylebone. After the end of World War 1, the B2s did operate some of the London express services again, but were replaced by a further batch of D10s and the new B3 'Lord Faringdon' 4-6-0 locomotives. During LNER ownership, the B2s were also seen on services to Immingham. Due to a series of excursions from Grimsby to London operated in the mid-1930s, the B2s were actually more likely to be seen in Kings Cross than their 'home' of Marylebone. During World War 2, all of the B2s were based in Lincolnshire and could be found operating all kinds of traffic. From 1942, they were often seen further afield including troop trains to Southampton. Although already noted for poor performance and steaming abilities, the B2s were capable of reasonably high speeds and handled their modest duties well but were no comparison to many other LNER 4-6-0s and Atlantics. Despite their poor performance, the B2s/B19s survived through to 1947. This is probably due to the LNER's general poverty and extended by World War 2 austerity measures. Although there were two main variations in cylinders and boiler specifications, the locomotives affected were different. Hence, this table is split into two listing the specifications for each group. Cylinders: (2x inside) 20x26in. 21.5x26in. Heating Surface: Total: 2477 sq.ft. 2387 sq.ft. Firebox: 163 sq.ft. 163 sq.ft. Grate Area: 26 sq.ft. 26 sq.ft. All of the B2s were withdrawn by the end of 1947, and none survived into preservation. Nu-Cast have sold a kit of the B2 for OO gauge (4mm scale). This is no longer in production, but may be re-introduced if Nu-Cast receive sufficient advance orders. Jay Lines, K's, and Leinster have also produced 4mm scale kits, but current availability is unknown. The accompanying image is of a heavily-modified Jay Lines kit, built by Morgan Gilbert. Gladiator Models and Leinster both produce O gauge (7mm scale) kits of the B2 'Sir Sam Fay' class. The nameplates were removed from No. 5472 City of London in September 1937. None of the B2s received their allocated numbers in the first 1946 re-numbering. The 1946 numbers listed are from the second 1946 re-numbering. Thank you to Malcolm Peirson for the photograph of GCR No. 423 Sir Sam Fay. Thank you to Morgan Gilbert for the photograph of his model of GCR No. 423 Sir Sam Fay. This model is was built from a heavily-modified Jaylines 4mm scale brass kit.